ACR Reward Their Players More Than ANY Other Site. FACT! Online poker players looking for the best value in terms of loyalty rewards and perks will find Americas Cardroom to be at the top of the list in the entire industry. Along with ACR's Elite Benefits VIP program that offers the highest percentage of cash back bonuses, the US-friendly poker room also runs the popular "The Beast" and "Sit & Crush" progressive rake races. Those weekly leaderboard competitions have together paid out more than $22 million since launching. That's a lot of cold, hard cash for serious grinders. And that's above and beyond the cash available in the military-themed loyalty program that pays valuable rewards to players at all VIP levels. While the VIP program gets a huge salute from loyal ACR players, so too does the Welcome Bonus, a generous 100% up to $1,000 for newbies to the site. Even better is the bonus for players who make that first deposit with any one of more than 60 cryptocurrencies accepted at Americas Cardroom, as the Welcome Bonus is boosted to 200% up to $1,000. A nice bonus to be sure, just like The Beast, the weekly rake race for cash game players that's entirely free. Money to fund The Beast, which to date has paid a whopping $17,992,274, is taken from the rake - not from player pockets. The Beast leaderboard winners are paid every Monday as the contest runs from Saturday at 00:00 and ends the following Friday at 23:59. The beauty of a weekly points race, as opposed to monthly, is that players can devote time to grinding in 7-day stretches of their choosing - not a full 30 days. Players who enjoy Sit & Gos more so than cash games are not left out from collecting leaderboard prizes thanks to the weekly Sit & Crush progressive points race. Just like The Beast, Sit & Crush is funded from the pockets of ACR - not the players themselves. 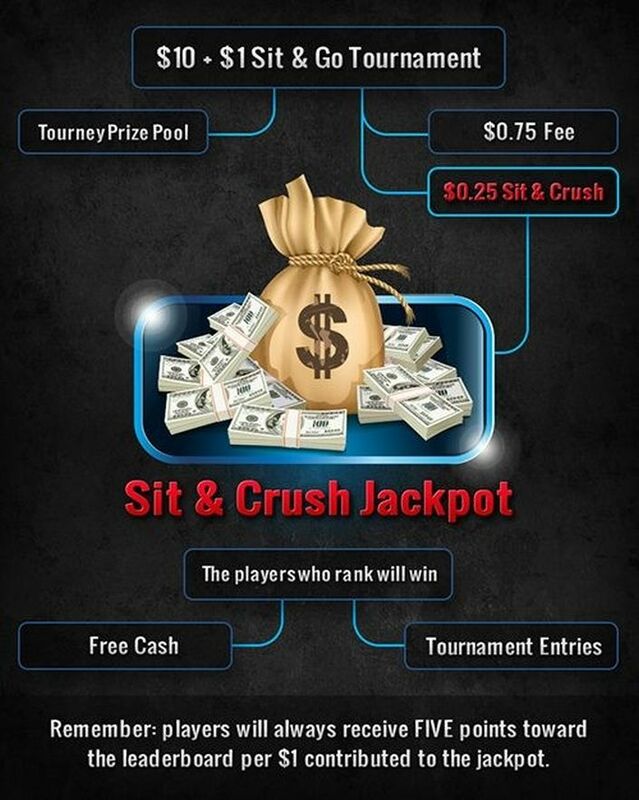 Eligibility includes players who compete at "Jackpot Poker" and “On Demand” tournaments, as well as Sit & Gos. Leaderboard winners are ranked by the amount of points earned from games played, not by money won or lost at the tables. As of this writing, the Sit & Crush Sit & Go rake race has awarded $3,828,463 in prize money since inception. Take a look at the image below that briefly describes how Sit & Crush is funded. There is no denying that no other site gives more money back to players than Americas Cardroom. The Welcome Bonus, Elite Benefits VIP program, and weekly leaderboards have made ACR the favorite poker site for players interested in obtaining the best possible value.